A stunningly skilful piece of Rococo carving by the Venetian sculptor, Antonio Corradini (1688-1752), executed in 1752, the last year of his life. 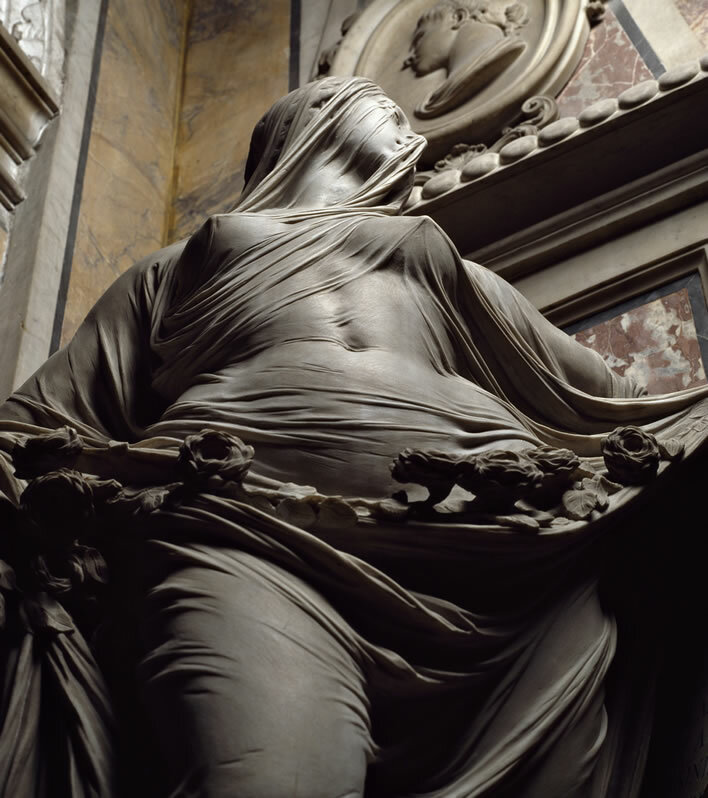 The piece is in the Sansevero Chapel Museum, Naples. Images: ©L’Atlante dell’arte italiana. 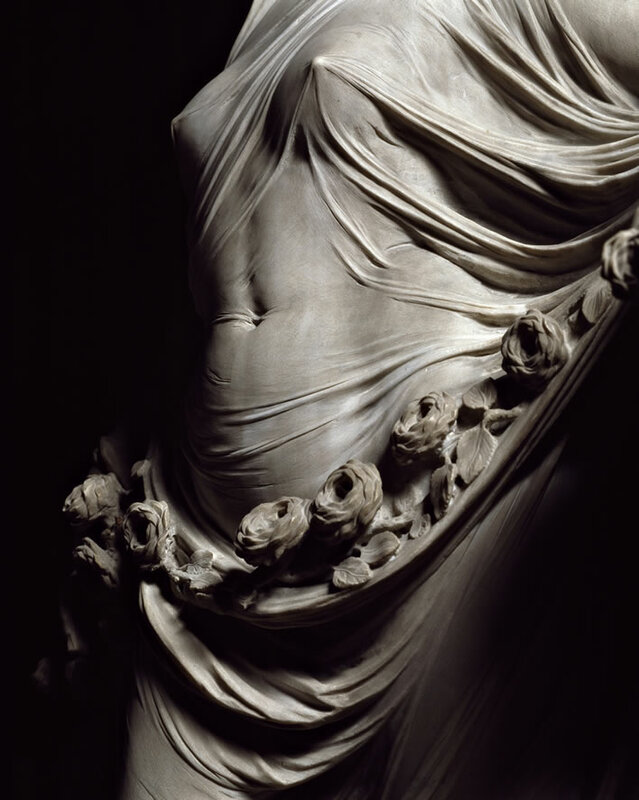 The piece is titled Pudicizia/Modesty, which is quite perplexing given the model's impressive physique under the wonderful transparent rendering of the clinging veil. The title is absurd – absurd enough to have lasted more than 250 years. The work is ostensibly a memorial to Cecilia Gaetani dell'Aquila d'Aragona, the mother of Raimondo de Sangro, the person who paid for it. 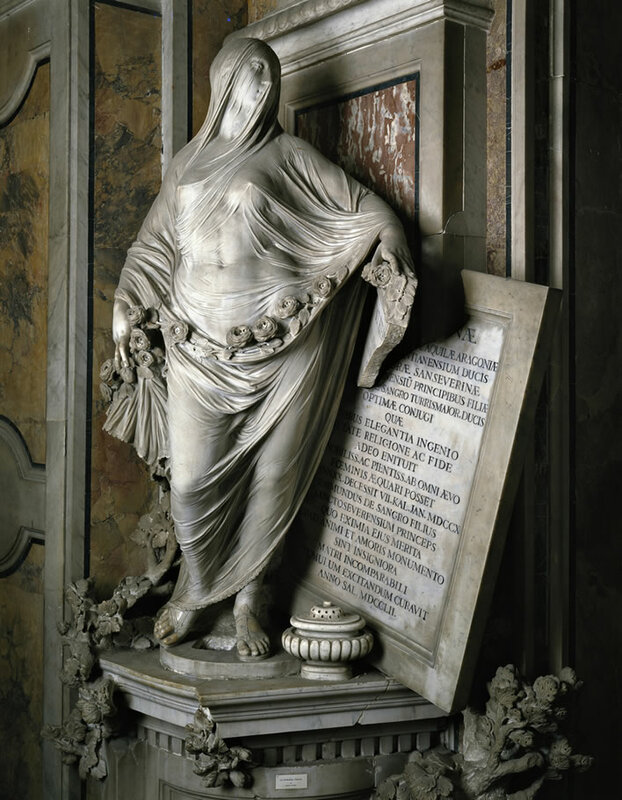 She died in 1710 when her son was one year old, just about the time when Corradini was beginning his career. It cannot therefore be a figurative life model of her and Raimondo would have been a very strange son indeed if he had wanted his deceased mother represented like this. The statue must of course be an allegory, the schematic face alone tells us that. But an allegory of what?. The brains of the Italian art world review the symbols in the piece – the roses (?) across the lower abdomen, almost as though they had just been gathered and laid in the fold of the veil; the vine stock (?) and the oak branch (?) bursting out of the marble; the broken inscription tablet – and…	take a guess. 'Wisdom', 'Isis', 'Life and Death', 'Fertility', 'Motherhood', 'Persephone'… any more? One allegory it is definitely not is 'Modesty'. George Meredith, Modern Love, (1862), Poem XIII, lines 1-9. 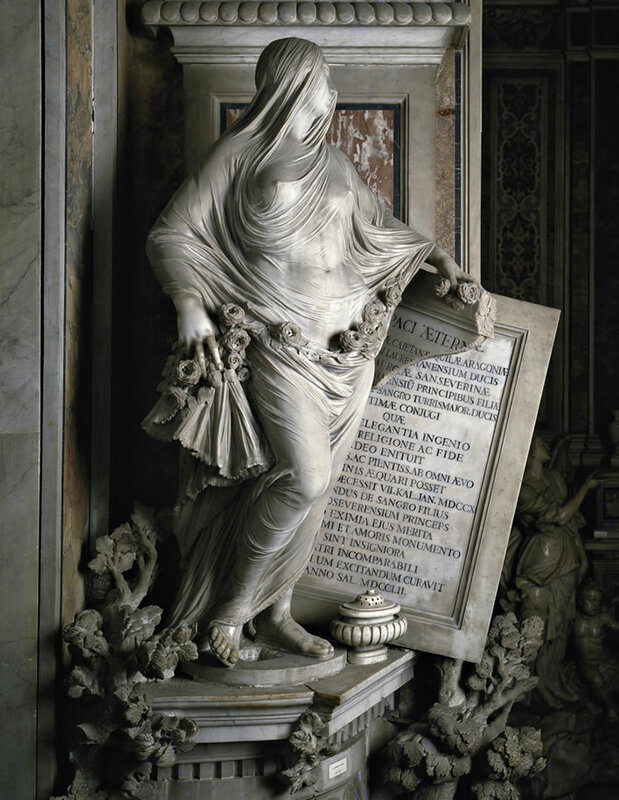 In Corradini's figure, 'Nature' gathers her roses in her right hand, our view tracks across the swash of the veil until we see her left hand, which holds a rose, the leaves of which have wilted down the broken edge of the memorial tablet. Perhaps all this theorising is wrong: perhaps he was just showing off	– nice female, nice flowers, nice vine, spectacular veil effect –	which is what he indubitably did in this work anyway. As a sculptural act, the piece is in no way 'modest'. We could argue that 'showing off skills' is actually a good definition for 'Rococo'. 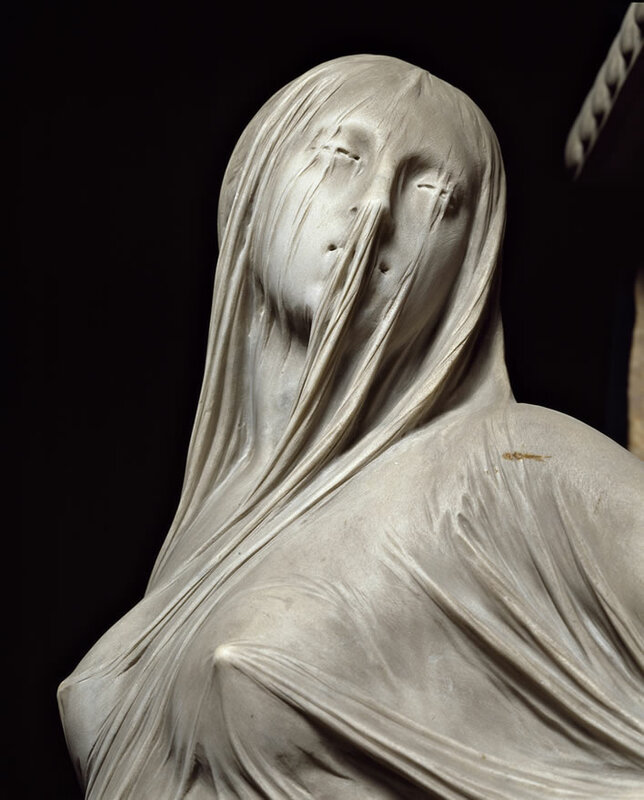 Corradini had developed the 'veiled look' in some previous works and this turned out to be the last and the most accomplished of the series. Whilst on the subject of Corradini we note that he spent a good part of his career working in the Austrian Empire. He it was, indeed, who sculpted the design for the grave monument of Saint John of Nepomuk in the Metropolitan Cathedral of Saints Vitus, Wenceslaus and Adalbert in Prague, which was then executed in silver – an outstanding example of Catholic economic excess which we discussed in the context of the lack of the Protestant Ethic in the Empire.